Outside the Box: Newsflash! It's Tuesday! Aren't they lush happy colours! The image was coloured with Promarkers and mounted onto some cerise glitter card, layered onto gold paper and some green card. A nice bow from some green gingham (I bought a bow maker, can't you tell!!) Some shiny green dragonflies and a nice chipboard sentiment. I will send this card to a friend you had the biggest ginger cat you have ever seen, called Basil, she was watching Fawlty Towers when he arrived as a kitten. They were soulmates and he sadly passed on three years ago aged 19 - she won't have another cat but she so misses him and she will love this card! Well that's my offering for today, come on over to the Outlawz Colour Challenge for your chance to win some gorgeous digis from Sweet Pea Stamps! 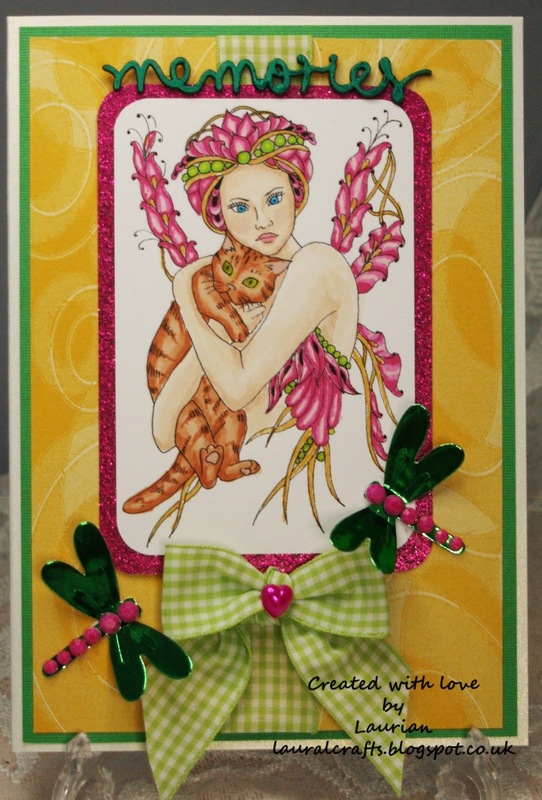 I love this challenge Laurian, and your card is GORGEOUS. The shimmering green dragonflies and sentiment are wonderful!